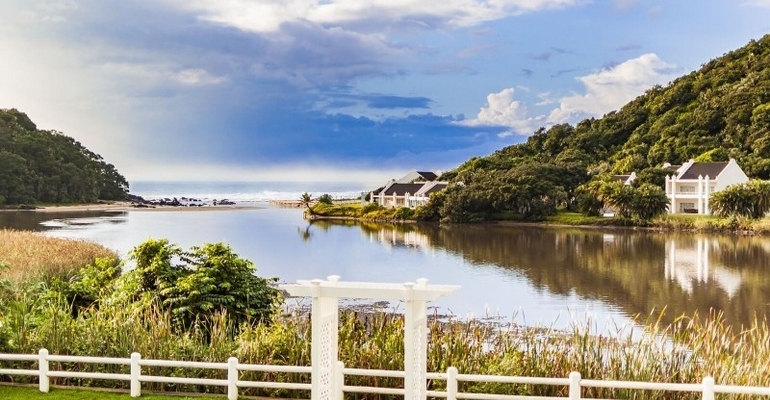 The Estuary Hotel & Spa is located on the KZN lower South Coast, offering accommodation in 44 spacious and comfortable rooms, each with a balcony & emphasis on privacy and comfort. Sea-facing, waterfront, or lagoon-facing rooms are available. Facilities include complimentary Wi-Fi, private balconies, air-conditioning, room safe, bar fridge, select DSTV, and coffee-making facilities. All accommodations includes breakfast. Originally built in 1941, this Cape Dutch style Hotel overlooks the Estuary and has secluded access to the protected Silver Beach. Suited to corporate occasions, couples retreats, and family getaways, our Standard Rooms have 1 double bed, sleeping 2 adults, Deluxe Rooms have king size beds and jacuzzi baths, also sleeping 2 adults, and our Family Rooms have 2 double beds, accommodating 3 adults or 2 children. Enjoy spectacular views of the estuary and beach from the terrace, or grab a decadent meal from the a la carte menu at The Fish Eagle Restaurant, not forgetting their famous Sunday Lunch Carvery. The Sao Joao Bar is perfect for enjoying a drink over the game, and the pool-side Blu Bar is great for enjoying a sun-downer over 180° views of the exquisite surroundings. There are 3 meeting rooms accommodating up to 300 delegates and provide functional, innovative space for one-on-one meetings, launches, or group breakaways. You can also pamper yourself with a spa package, a relaxing massage, or divine beauty treatment, while the kids are entertained at Bubble Blu, a complimentary activity-packed kiddie center for guests, with a jungle gym near the pool. 20-Minute Drive from Margate Airport.